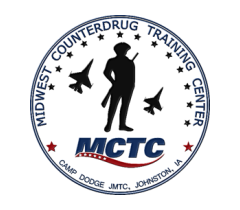 Midwest Counterdrug Training Center is one of five Department of Defense funded Counterdrug training schools. MCTC is administered by the Iowa National Guard Counterdrug Task Force. Since beginning operations in 2003, MCTC has trained over 150,000 local, tribal, state, and federal law enforcement officers, military members and prevention and treatment professionals across the United States. MCTC trains local, state, and federal law enforcement officers, as well as prevention, and treatment professionals with an emphasis on small and rural agencies. MCTC maintains a lean staff and uses federal contracting procedures while providing the highest quality of training. MCTC offers courses year-round on Camp Dodge JMTC, Johnston, IA. Mobile training is also available for most MCTC Courses – bringing training directly to where it is most needed. Full course descriptions, eligibility, prerequisites, and registration can be found on this website. Please contact the Director of Training for any additional or offsite training requests. Would you like to host one of the many MCTC courses? Mobile training requests can be submitted on this website. All you need is a classroom and the ability to attract students from your area—we will handle the rest! Click HERE to download an MCTC informational flyer.